Registration has closed for the September 2019-2020 school year. Parents of students wanting to register their child in Kindergarten for September 2020 are to follow the online process for Choice Programs which occurs in the fall of 2019 in addition to attending an Information Session. Registration has closed for Grades 1 and 2. Parents of students entering Grades 3 and 4 in September of 2019 who wish to apply to the program must attend an Information Session on Thursday, March 7, 2019 at Gordon Greenwood Elementary at 6:30pm. If you would like to receive information about the program in the future including dates/times for Information Sessions click HERE! 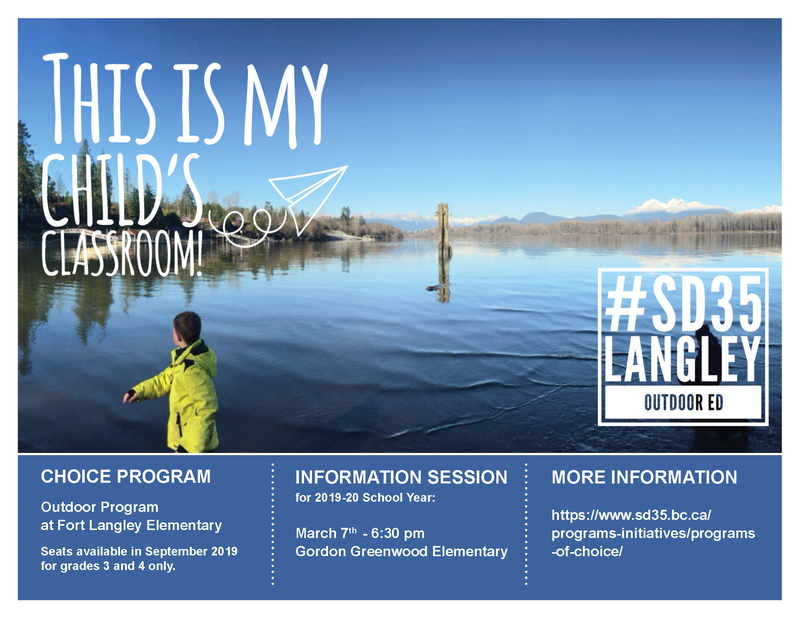 The Langley Outdoor Education program seeks to nurture practices of learning and teaching to include a significant portion of the school year spent in meaningful, outdoor place- based settings throughout Langley. Learning will be cultivated in local places close to the program schools and in other parts of Langley. Experiences in natural settings will be made so that diversity, complexity, stewardship and sustainability become part of the students’ understanding of their place and world. Educators will use the current curriculum and the CARE document to organize and conceptualize environmental learning. Use of the outdoors makes a major contribution to physical and environmental education and enhances many other curriculum areas. It contributes to personal growth and social awareness and develops skills for life and the world of work. Qualities such as a sense of responsibility and a purpose in life are nurtured. 2017-18 SCHOOL YEAR – 1st Year of Program! The Outdoor Education Program opened its doors at Fort Langley Elementary in September of 2017. Ms. Marlee St. Pierre (kindergarten) and Ms. Ashley Harder (grade 1 and 2) were hired as the teachers of the two classes, and their passion for outdoor learning is ensuring a strong start for the program. They have engaged parents in the program and have ensured that students are working and learning outdoors as much as possible right from the beginning. The goal is to be learning outdoors 60 percent of the time. Mondays through Wednesdays are for learning outdoors. On Thursdays and Fridays, both classes are working and learning in classrooms at Fort Langley Elementary. A Special Education Assistant is dedicated to the program, providing extra support to students with special needs and assisting in ensuring student safety in outdoor environments. The program expanded for the 2018-19 school year to include grade 3.